73534404 -Increase students’ ability to comprehend spoken Spanish; express their ideas & opinions; and analyze cultural perspectives while challenging fixed beliefs and cultural stereotypes. These outcomes motivated the respected author team of Así lo veo, the first Intermediate Spanish program to use a documentary, filmed specifically for the program, as the basis for instruction and learning. Since a documentary captures real situations and personal perspectives it is the perfect vehicle for increasing student engagement. With Así lo veo, the documentary motivates the presentation of content—vocabulary, grammar, and culture—and by extension, the learning. 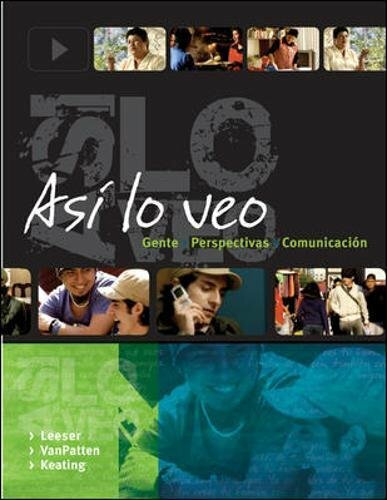 Specifically, Así lo veo documents how six Spanish speakers view timely, provocative themes. Because these are everyday people, not actors, they bring unscripted, real language as well as fresh ideas to the context of learning Spanish.